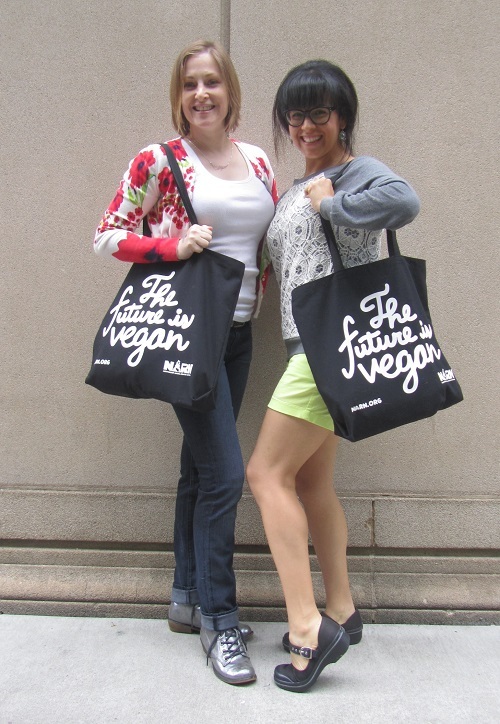 I had a lot of fun at Vida Vegan Con, the vegan blogger conference I attended last week. Most bloggers had food blogs, some had lifestyle blogs, and a few had style blogs. Everywhere I turned I saw fashionable bloggers! 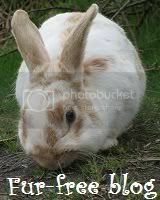 It was hard to get photos though–we were all so busy. I managed to get a few shots at least. I stopped Ky Lee Fournier because I loved her casual style. I’m a huge fan of fedoras and skinny jeans and I like how she threw a denim jacket into the mix. The faux leather booties add a bit of toughness and the cotton floral bag is a great soft spring piece. 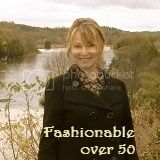 Ky Lee is a vegan sports nutritionist from British Columbia and she’s as fit as she is stylish! When Londoner Kip told her friends she’s had her photo taken for a style blog, they laughed. Kip runs The Messy Vegetarian Cook blog and is known for her recipes, not her outfits. But who’s laughing now? 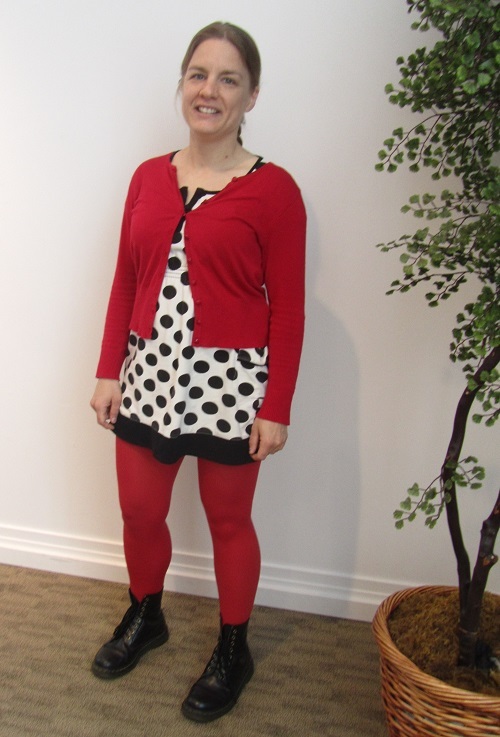 From the red tights and adorable polka-dots to the cute cardi, this is a great look. I think I need a pair of 8-hole vegan Dr. Martens now too! I was thrilled to meet Jesse Anne O in person. I’ve been reading her blog for a couple of years and was thrilled when I found out she was going to VVC. She runs a smashing style blog with a focus on ethical attire. I love following her New York adventures and seeing what she’s thrifted. She’s also got her pulse on vegan designers and local shops. As proof that we met, here I am with Jesse. 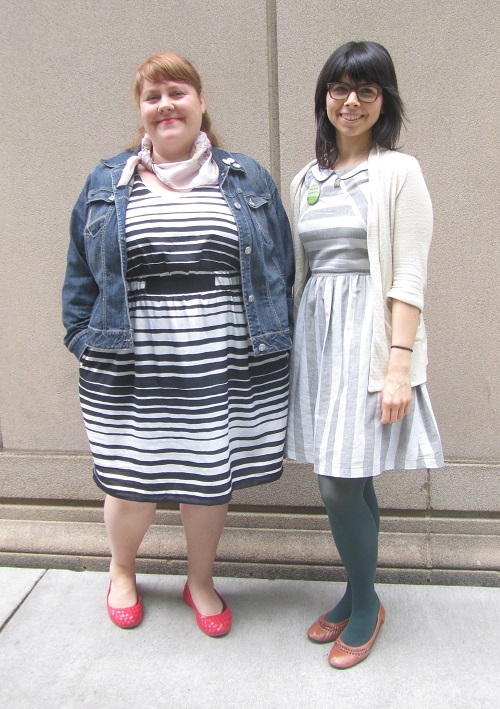 I saw a few people donning stripes over the three-day conference. Case in point: Anika of Vegan Score and Dawn of Vegan Moxie. I know these two lovelies from Seattle and it was great to reconnect with them in Portland. I love Anika’s black, white and red look. She shows how to “dress down” with a denim jacket. And you’d never know it, but those cute ballet flats are Crocs! Waterproof shoes for temperamental spring days–genius! Dawns tights and cardi are a great way to wear a summery dress when it’s a bit cool out. I love how she chose green tights and caramel faux-leather flats. Adorable! Helen and Molly are also from Seattle. They are the voices behind Vegtastic and Vegan Princess in an Omni Kingdom, respectively. I paired them up for my impromptu shoot because they both had on dots. 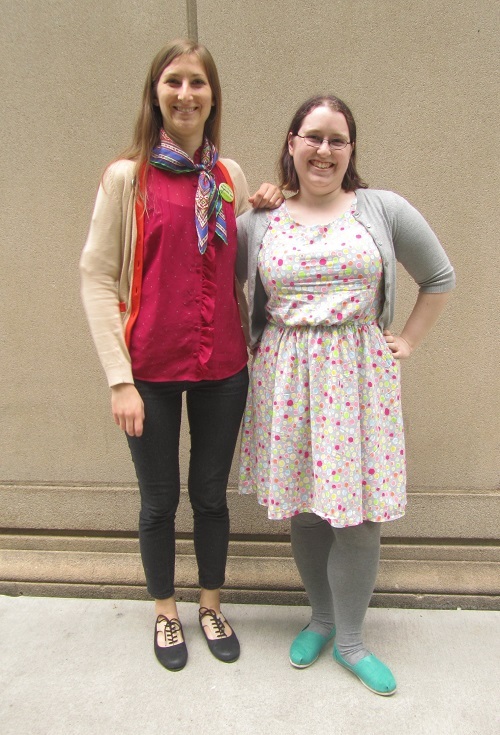 Helen’s top has a subtle Swiss dot and Molly’s dress is a whimsical circle print. I like how they show how to layer with cardigans and how to rock flats. I think Helen might be wearing Cri de Coeur (and Jesse, above, might have on the same style. Great minds…). Speaking of great minds, meet Megan and Megan. Megan on the left, runs The Opinioness of the World, an awesome blog filled with info about film, food, and feminism (among other things). I almost bought the very scarf she’s wearing but I left it at Herbivore Clothing. Moments later, unbeknownst to me, Megan popped in and got it. Good call! It looks great and it’s super soft. 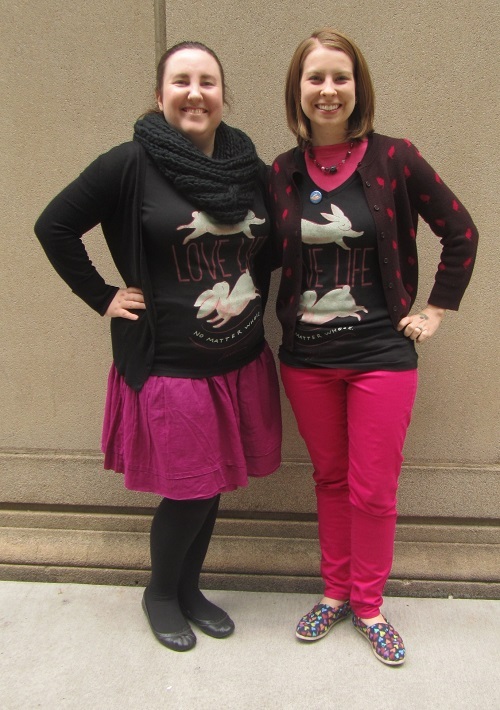 Both Megans got their shirts at Herbivore, which is why I thought they looked so good together in this post. It’s a black and fuchsia theme! The shirts read “Love life: no matter whose.” A terrific message! I like how these women took the same shirt and created completely different outfits. Megan on the right is on twitter and YouTube and has tons of adorable cat stories and photos because she fosters kittens. Awesome! Finally, it’s me again. But only because I bumped into Lulu. We’d been carrying around the same bag all weekend and had a couple of photo ops together. Lulu looked fantastic all weekend long. I wish I’d gotten pictures of her every day. Her wardrobe is all about color and texture and she makes it seem effortless. She doesn’t have a blog–yet. Here’s hoping to that happening soon. No pressure, Lulu! There you have it. I did snap a bunch of photos at the vegan gala, so look for that post next! 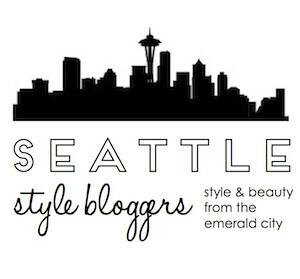 Love the post, and I know Helen from Seattle, she makes killer gluten-free cupcakes too! Thanks! Glad you like it. Small world too! Helen is great–I’ll have to ask her about the cupcakes. I haven’t been lucky enough to try any (although she did introduce me to Highline’s vegan confetti cake–probably not GF though). Just came across this post! Love the fashion recap of all our stylish attendees! Thanks for writing! 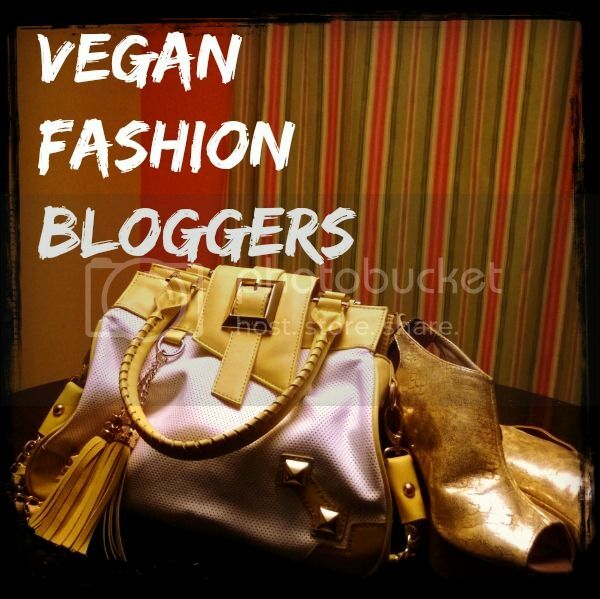 There were so many stylish vegan bloggers! I wish I had taken more pictures.